I was looking for a special breakfast to have after my daughter’s sleepover birthday party. I wanted to do something different besides waffles, pancakes or cinnamon rolls. 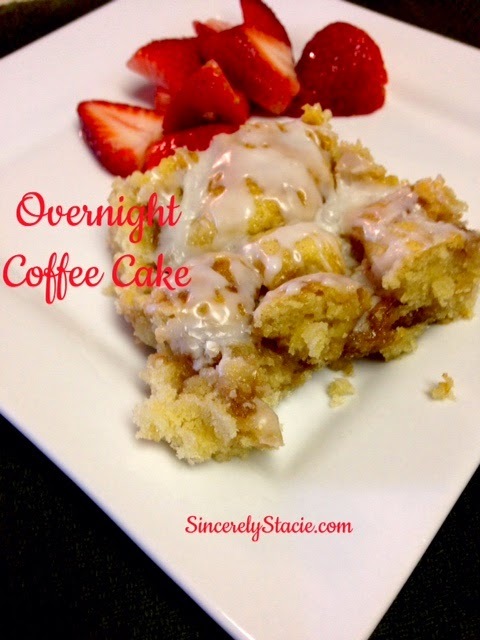 That week I spied a recipe for coffee cake. Our daughter loves coffee cake so I decided to give this a try. Her brothers also had friends over that night and let me tell you, there wasn’t a single piece left of this cake. My husband didn’t even get a piece! Which reminds me, I need to make this again for him! This definitely is not a quick morning breakfast, but would make for a great Easter morning treat alongside some eggs, bacon and fruit! Be sure to plan ahead by making it the night before and then be sure you have at least an hour before eating it the next day. But, trust me, this coffee cake is WORTH THE WAIT! Be sure to let me know if you make this and how your family likes it! For a Printable Link to the recipe, Click HERE. Beat butter at medium speed with mixer until creamy; gradually add sugar, beating well. Add eggs, one at a time, beating until blended after each addition. Combine flour, baking powder, baking soda, and salt in a medium blow. Add flour mixture to butter mixture, alternating with buttermilk, beginning and ending with the flour mixture. Stir in vanilla. Pour batter into greased and floured 9×13 pan. Cover tightly and chill 8-24 hours. Preheat oven to 350 degrees. Let cake stand at room temperature 30 minutes. Stir together all cinnamon crumble ingredients and sprinkle over top of cake. Bake 32-35 minutes or until wooden pick inserted in center comes out clean. Combine powdered sugar and milk until desired consistency and drizzle over warm cake. Notes: You can add chopped pecans, walnuts, or slivered almonds to the crumble topping if you like. You can also add more glaze depending on your likes. I felt like 1 cup was enough, but you may like more glaze, so feel free to double it to 2 cups and 2-3 tablespoons of milk. Oh, this looks and sounds delicious! I'm pinning this to make for sure! !